Innovative Safety Systems (ISS) presented two new team members and their latest advanced RX3 Hard Disk Recording system at the recent Plant & Waste Recycling Show in Torbay. Oliver Hoadley will be looking after ISS sales across the South East including London, Bedfordshire, Suffolk and Hampshire, and David Hennessy is looking after the North. David Hennessy who retired from 18 years of service with Dennis Eagle in 2010 couldn’t resist the opportunity to work again with old friends at ISS. 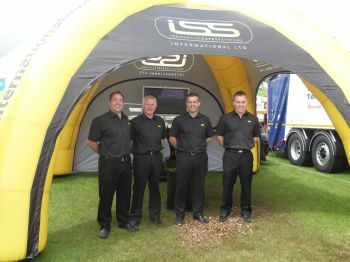 The Show was a big success for ISS who launched the successor to their record selling RX2 Hard Disk Recording system. The new and advanced RX3 DVR system offers a host of new features including improved image quality & frame rate, second tier solid-state SD card memory storage, plus the system is Live View ready. For more information about Innovative Safety Systems tel: 01455 557274, email info@iss-international.co.uk, or go to www.iss-international.co.uk.